Decorate six pretty princesses with ribbons and lace – and build up your hand-eye coordination! Trace around the princesses’ wands, crowns and wings – and build the hand-eye coordination that gets you ready for writing! With a delightful range of pretty shapes to trace and lace, this lovely kit is a wonderful way to build first skills. Each large and chunky picture card comes with perforated lacing holes. 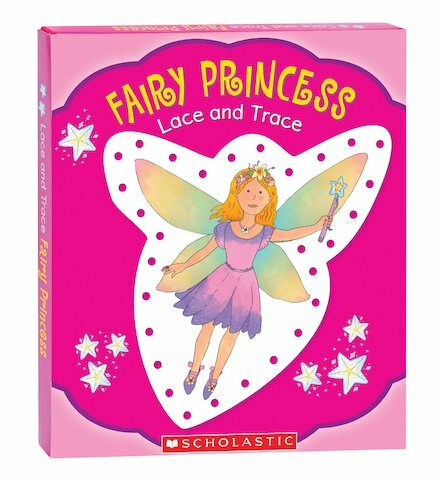 Use the colourful laces to sew through the holes and bring each fairy princess to life! As you get creative with a range of patterns and colours, stitching these cards will also develop good vision perception and motor skills. Set includes six chunky picture cards and three colour-coordinated laces.